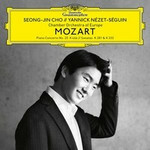 Seong-Jin Cho, first prize winner in the 2015 International Chopin Competition in Warsaw, has had discs of Chopin and Debussy issued on Deutsche Grammophon, and he now adds Mozart to his list – and very nice it is. At first I was a bit put off by this performance of the Concerto. The pianist and conductor, Yannick Nézet-Séguin, certainly have a rapport, but I felt that key orchestral phrases were too intrusive. After repeated listening, discussion with a pianist friend, and a comparison with other recordings, I have come around to the chosen approach that really brings forward a very dynamic sense of syncopation, especially in the opening movement. By contrast, the recording with Rudolf Serkin, under George Szell, comes across as very strait-laced. The two Sonatas are nicely contrasted, one sunny, the other more moody. There is a lively imagination at work here, and the results are beguiling. Both recording sessions are beautifully engineered. I think we will hearing many more wonderful things from Seong-Jin Cho.